If you're in or around the city of Leicester tomorrow here's your forecast. The picture above is from a fantastic piece of software called zyGrib. It's not just Linux only this time it's for all you Windows and Mac users too. If up-to-date weather forecasts are your thing or might just be useful to you then zyGrib could be your best friend. Not only because it's free but it's really useful too. It's basically a very complete Grib file viewer. Before yesterday I hadn't even heard of a Grib file. Now I love them. More information can be found here and there's a list of other useful software in that link that also uses Grib files. I wasn't in work today. I organized, at the last minute, an impromptu holiday. There were a few things I wanted to do. Odd jobs that just stack up over time. One task that has been on my mind is my mushroom antenna. 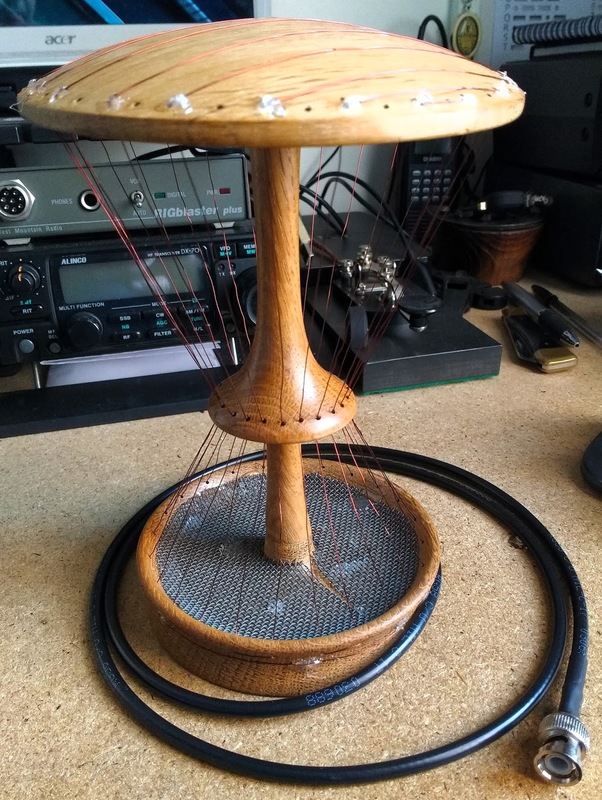 I bought the stand a couple of months ago with the idea of turning it into an antenna. It already had holes in the top and middle discs. I added some at the bottom and threaded it with wire. I finished it about half an hour ago. At this point I don't know where it is resonant. Don't know what it's good for and I don't know if I've wasted a day on this thing. It could be one of my few but intricate follies. My plan is to attach it to my SDR and see if it picks up anything at all. 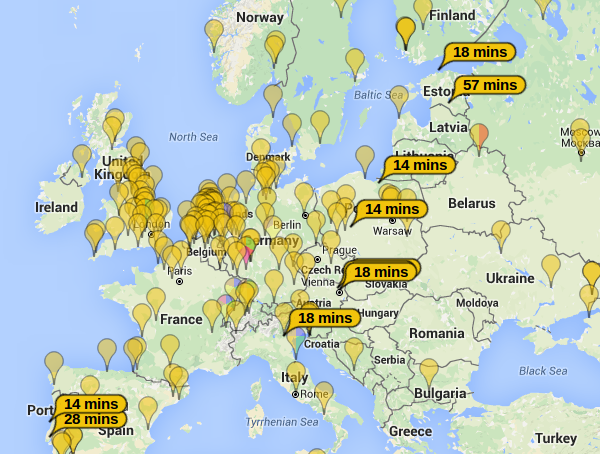 From there I might try a bit of satellite surfing and beyond that maybe a little HF reception test. It'll probably end up as some kind of dusty ornament, but maybe not. 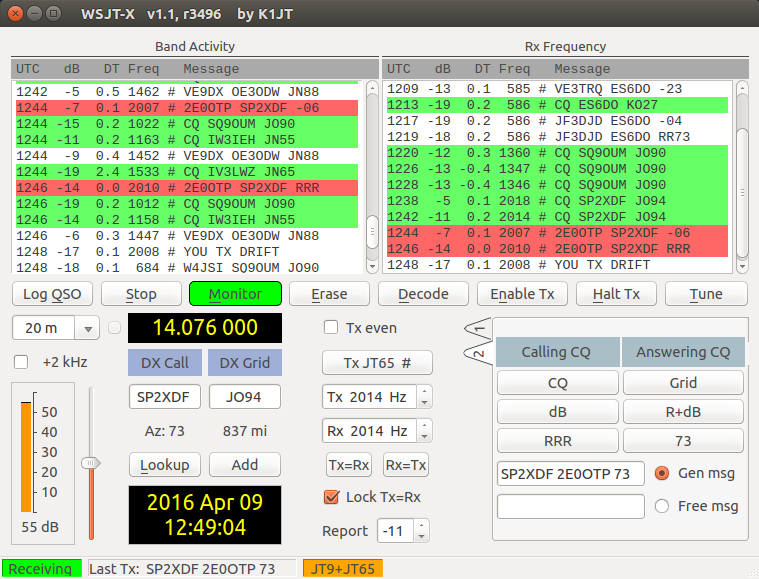 Since getting the Rigblaster working I've been itching to have a go at JT65. This afternoon I made my first QSO with Piotr in Poland, some 837 miles away. What makes this a bit special is that I decided to go QRP which means I was on the low power of 5W. 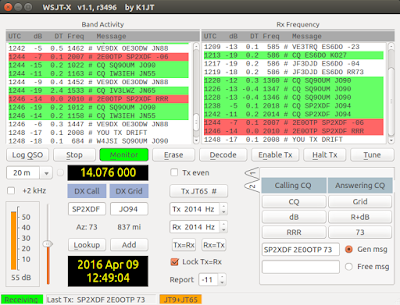 I wanted to test my radio, antenna and the WSJT-X software. JT65 is a weak signal digital mode so my approach was justified. It's good to have a challenge. To demonstrate just how far 5W will go take a look at the map below. The large markers are stations that monitored my signals. Not bad for the equipment I'm using and reassuring for further exploits in this mode. This week's Sunday track is just about perfect for whatever activity you are pursuing. That may be be running, cooking or just browsing the duvet. For me this is something worth mentioning not least because my old iPhone 3GS served me well for 6 years. That's a long time in technology years. I took my time choosing a new phone. There was a good reason to buy an iPhone because of the money I've spent on apps but the phone's really are just too expensive. While I'll admit my 3GS has been good value, the walled garden that is Apple has left me with a phone that is out of date and good for very little even though electronically it's in very good working order. What I needed was something cheaper, up to date and was capable of running the few apps that I wanted to run on the phone. The Moto G 3rd generation is what I went for and I'm pleased with my decision. While it's described as an 'entry level Android phone' to me it's light years ahead of the 3GS. It does everything I need it to and more and the switch from Apple to Android has been painless. Everything is different and the same. The learning curve isn't steep at all and after a week of use it's a very familiar device. It's much the same as moving from Windows to Linux. There are things that are better and things that aren't so good but I'm very happy to work with what I've got. I still have my iPad and the thought has crossed my mind, will I ditch Apple altogether when my iPad is near useless. Maybe, maybe not. I'll decide when the time comes.